SupportStore announces the immediate availability of the Verse-a-band brand of rubber wristbands designed and produced by SupportStore. 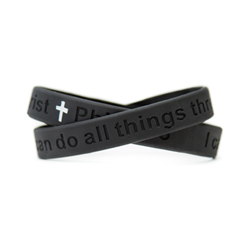 Available in an adult size that fits most wrists, and packaged in an individual polybag, these 100% silicon rubber bands may be purchased by individuals in quantities as few as one, or Christian or church organizations with events or fundraisers in bulk quantities. Price is $2.50 each, with quantity pricing displayed on the website and mobile app so orders can be placed online reflecting discounts for quantity purchases without having to request a special quote. A portion of each sale is made available for donation to one of several charity organizations. Customers choose from 500 in-stock items that ship same day, and an assortment of Christian products, such as a “Pray” oval car magnet, silver fish for cars, or gold cross lapel pins. Customers can also choose to create a custom designed magnets in quantities of 125 or more, many delivering within 10 days. With a total inventory of over 500,000 items, SupportStore supplies both consumers and businesses with products for fundraising events, awareness programs or memorials. SupportStore was founded in 1999, has 6 employees, a warehouse in St. Louis, and enables buyers to donate a portion of awareness item profits to charity.